It's been very quiet around here. We are still here tough. Not sailing obviously. It's been 3 months since we went into hibernation. And it starts to itch to go sailing again! Our boat is cleaned and almost ready for a new season. But that season only starts in March. So 2 more months of waiting and trying to forget (it's impossible) how great being on the water really is. Even on Catsailor (the forum we frequent) it's very quiet. Only the new Hobiecat F18 can bring some interesting news. 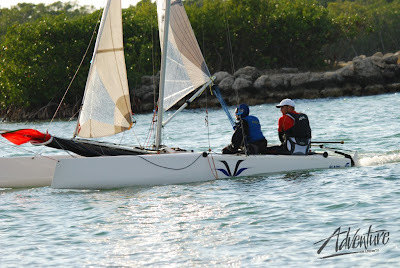 In the US they had the Midwinter F16 race, at Tradewinds, Florida Keys. Matt & Gina McDonald won, followed by Tim Bohan and Andy and 3rd place went to Ben Moon and Lindsay Cross. Full story can be found here. The other thing that keeps us occupied is the online Volvo Ocean Race. Our boats are named: "BEL 666" and "The Green Team" and we are member of the Catsailor group. Currently we are sailing leg 4 and it's going very well. - Eurocat Carnac, in May, first real big race of the season. Hope to see some fellow F16 sailors there! - The F16 Global Challenge in Florida. November 2009. We so would like to be there! And this picture makes me want to go sailing!!!! (Ben Moon on his Blade at Tradewinds, copyright picture: Adventure Online Tv, follow this link).